The song "This Town Ain't Big Enough For Both Of Us" which jumped to #2 in UK is from the "Kimono My House" album. The original UK pressing didn't had a pic sleeve. All foreign releases featured the fantastic non-album track "Barbecutie" as b-side. The one from Singapore is a four tracks Ep including "This Town Ain't Big Enough For Both Of Us", "Hasta Manana Monsieur", "Amateur Hour" & "Talent Is An Asset". The German reissue of the late '70s features "This Town Ain't Big Enough For Both Of Us" as main track and "Amateur Hour" on the flip side. Second big Sparks hit single the song "Amateur Hour" from the "Kimono My House" rose to #7 in England. The original UK pressing didn't had a pic sleeve. All foreign releases featured the fantastic non-album track "Lost And Found" as b-side. In the States the single featured "Talent is an Asset" as main track instead of "Amateur Hour". Several month later a single from "Propaganda" was released for the North American market featuring "Achoo" b/w "Something For The Girl With Everything"
The single Never Turn Your Back On Mother Earth from "Propaganda" album jumped to #13 in the UK. All foreign releases featured the non-album track "Alabamy Right" and used the same pic for the cover sleeve with some slightly changes, Portuguese pressing excepted (the b-side is the same but it got a very beautiful color shot). "Alabamy Right" is a song which had been recorded before the recording of "Kimono My House" album with session-men John Porter and Paul Rudolph. Second single from the "Propaganda" album, Something For The Girl With Everything, reached #17 in the UK charts. The original UK pressing didn't had a pic sleeve. All foreign releases featured the fantastic non-album track "Marry Me" as b-side. In France the single featured "Propaganda/At Home At Work At Play" as main track but still had "Marry Me" on the flip side. The song Get In The Swing is from the "Indiscreet" album.The original UK pressing didn't had a pic sleeve. All foreign releases featured the non-album track "Profile" as b-side. The song "Big Boy" is from the "Big Beat" album. The original UK pressing didn't had a pic sleeve. All foreign releases featured "Fill'er Up" as b-side. The version of Lennon & MacCartney's "I Want To Hold Your Hand" seemed so incongruous even for Sparks that it never appeared on any album. 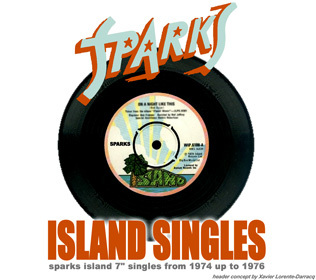 A single was released as Sparks' in a few assorted foreign lands with another non-album track, "England", on the flip side.